The element strontium gets its name from the village of Strontian – situated on the shores of Loch Sunart in the south-west of Lochaber, Highland – where the mineral was discovered. A quick Google search establishes that Strontium is 'an alkaline earth metal, a soft silver-white yellowish metallic element that is highly chemically reactive. The metal forms a dark oxide layer when it is exposed to air'. I like that last bit – the fact that air oxidises the strontium dark; black, even. Elemental notoriety aside, it is a different Strontian darkness that has oxidised my mind for many years: I have obsessed over American Black Duck. I'm happy to concede that I have something of an obsessive or addictive personality. As a youth, I was obsessed with badgers (the black and white nocturnal mammal, not pin badges), and other obsessions have and still do include heavy metal (with all its intoxicating trappings) and, more usefully, my European Turtle Dove fixation which has allowed for the various Dove Step conquests. For some years, I obsessed over Eurasian Wrynecks, building them up into a mystical creature and watching 'wrynecking' and ant-eating clips on YouTube. This obsession finally concluded on 23 August 2011 when I enjoyed a bird from Gramborough Hill on the North Norfolk coast. This was also notable as my 300th species of bird in Britain. Since 2011, no species has rivalled American Black Duck on my most-wanted list. Black Stork, for example, is high up on my dip list and comprises unfinished business. But American Black Duck – in particular the Strontian bird – has held the number one spot for as long as I can remember. These obsessions are not something I can choose. They manifest themselves, may even appear irrational and can at times be self-destructive. I do like to think they do demonstrate passion, a love for our natural world, even if some consider the various efforts ill-directed at times. For the past eight years, Strontian's enigmatic American Black Duck had sat at the very top of Jonny's most-wanted list (Jonny Rankin). The Strontian Black Duck is legendary. A constant of the UK birding scene for the duration of my time following national bird news, cropping up time and time again. First reported on Loch Sunart on 16 June 2007 – assuming the bird hatched stateside the year before – this individual is at least 13 years old, the same age as my dog! For the lifetime of my pup, the Sunart Black Duck has frequented Strontian Bay and sired various offspring with the local Mallard population. Age assumptions aside, the bird has spent 12 years as a Scottish resident, delighting many of the nation's birders along the way. 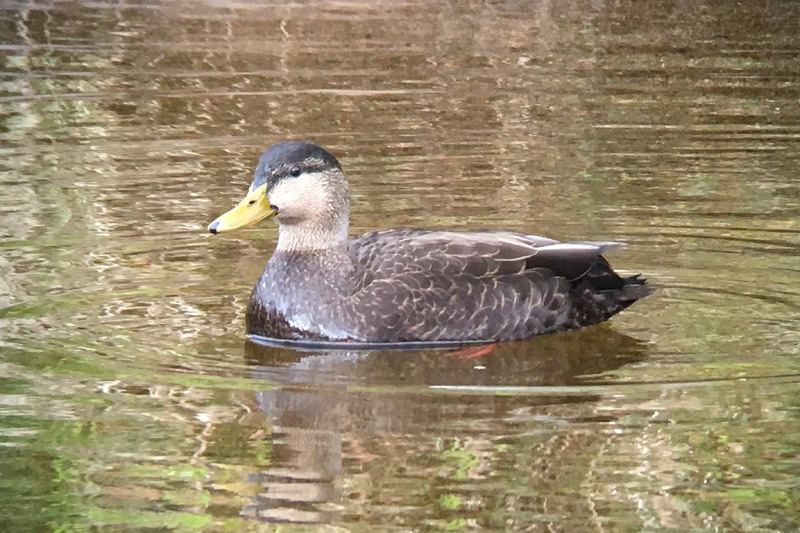 A review of BirdGuides reports reveals that, by 2011, Strontian was the favoured and repeated location for the American Black Duck, the elemental fame of the location now playing second fiddle to this Nearctic wanderer. Originally associated with the river mouth and frequently appearing in front of the Strontian Hotel, the bird is now more often seen upstream between the two stone bridges across the River Strontian. I try to get to the Highlands once a year. Having visited for as long as I can remember, it feels soothing and familiar, the landscape a perfect antidote to living and working in the flatlands of East Anglia. The Cairngorms have been a focal point with the mountain range itself, Caledonian pine forests and north Aberdeenshire coast beyond culminating in a bird-heavy draw. I have rather neglected the west coast since spending a couple of weeks on the Applecross peninsula with my dad back in 2000, but the lure of the American Black Duck has intensified with time and, without a Dove Step commitment in 2018, I was finally able to make the long run up with my birding friend Malcolm Fairley. 30 March dawned a clear, crisp blue sky morning, and even the chill air was welcome after the all-night drive. It was just the lack of target bird that put a damper on the day! Despite reports on 23 March and 1 April, we drew a blank and the already mythical beast was elevated even higher in my birding consciousness. Fast forward a calendar year and Malcolm and myself returned, this time resolute and prepared to spend up to three full days at Strontian and surrounds until we connected with the legendary beast. The weather was not as inviting as in 2018, although it wasn't raining and the clouds were sufficiently high to offer great visibility. We retraced our steps from 2018, checking Loch Sunart as we approached from the east, having caught the first Corran Ferry of the day. We scanned the bay in front of the Strontian Hotel and walked to the river mouth before turning our attention to the river itself from the stone road bridge. Several Mallard, Greylag Geese, Hooded Crows, Red-breasted Merganser, Eurasian Oystercatcher and Eurasian Curlew proved welcome distraction in pursuit of our target. After an hour, deja-vu kicked in and we decided on a coffee hit, readying ourselves for a long and potentially fruitless day in the field. As we walked back out from the village centre, Mal saw a group of Mallard flying around the crook of the river mouth. We decided to divide and conquer – Mal went downstream, while I walked the east side of the river itself, past the depot, fire station and field beyond. Before reaching the second stone bridge across the river, I noticed a drake Mallard, with another bird in pursuit. Glimpses through the foliage peaked my interest and I started to put together the snatched views … the darker bird in pursuit definitely had American Black Duck traits; if it was a hybrid, it was a good one! Remembering Mal was at the river mouth I panicked. I needed him on the bird too. Any concern over phone signal was needless – full 4G in the Highlands, better than in my own Suffolk living room! I got through to Mal and he started heading up to join me, I kept pace with the birds and the tree line broke enough to give me uninterrupted views. I was increasingly sure this was the real deal. 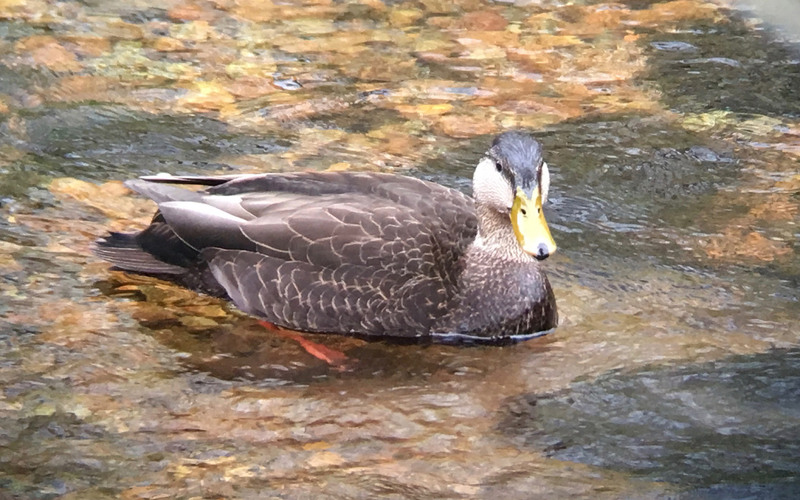 American Black Duck, Strontian, Highland, 29 March 2019 (Jonny Rankin). I could hear the bird in question gently calling back as it pursued the drake Mallard, the call pretty much indistinguishable from Mallard to my ear. Eventually the drake Mallard gave up and flew south towards the loch. At this point, I realised the apparent Black Duck was ushering the Mallard away from its mate. Mal joined me as the drake was threatening to disappear out of view, well above the second and northernmost stone bridge. Luckily, the bird flew downstream to rejoin its mate, giving excellent flight and underwing views. We had both secured views, but I wanted to get instructive photos and to be unequivocal with the identification. Having built up the bird for so long, I wanted to be sure I was not passing off a hybrid black-duck-alike, however convincing it might have seemed. As we walked back downstream, Dipper and Grey Wagtail were welcome sightings before catching up with the birds in the slack of the river beneath the overhanging bank. If the birds had been here during our 2018 visit we would have missed them, as our efforts focused on the western side of the river and surrounding ponds. Fortunately, our eastern vantage point gave a clear view across as the birds hauled out to roost and preen, allowing Mal to get a brilliant photo showing the speculum; brilliant, bright turquoise-blue and with no white borders. I had already seen the white underwing and axiliaries in flight and the clean demarcation between the breast and neck as well as bill. I was assured, as was Mal, that we were looking at the real thing, our quarry and my 360th UK bird: American Black Duck! 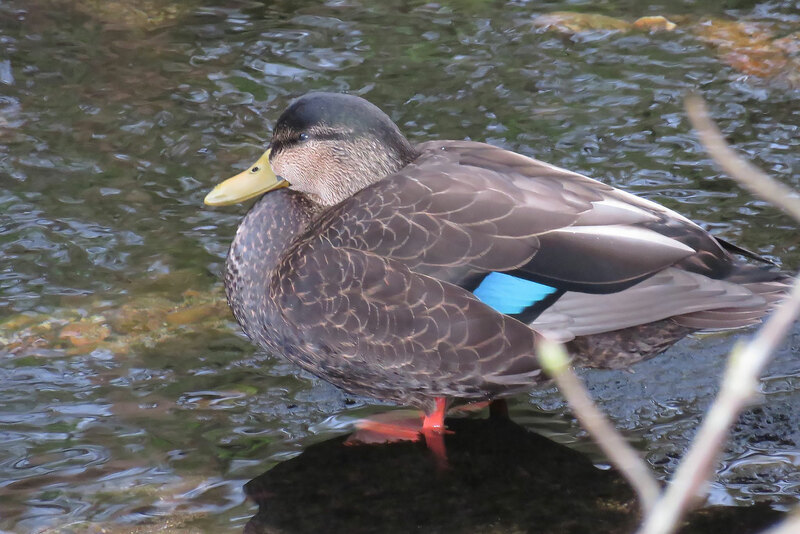 The drake American Black Duck exhibiting his speculum (Malcolm Fairley). As a side note, 60 species in eight years and accepting that people see more than that in one calendar year is not an impressive twitching resume. I do, however, love the birding and celebrating these small milestones on the way to 400 – especially when the tick is as seismic as American Black Duck. For me, it was welcome closure on years of unhealthy obsession. For Mal, it was his third attempt and a welcome addition to his burgeoning life list and a step on his march towards 500. After another coffee hit and breakfast, we spent more time with the bird and I used my Opticron 'scope and iPhone to take plenty of momentum shots. A quick guide for others visiting the area based on our visits: as mentioned, view the river mouth and bay from the garage and Strontian Hotel area before focusing the search between the road stone bridge as you leave the village heading westward and the second stone bridge accessed from the eastern side of the river. The Garbh Eilean Wildlife Hide, five miles west of Strontian on the shore of Loch Sunart, is a must-visit spot – seals, a heronry and wildfowl on the loch are a given. Our visit coincided with superb views of an adult and juvenile White-tailed Eagles roosting on the island. A local sheep farmer observed that Golden Eagles are seen less frequently now; she surmised that they have been pushed out by the White-tailed. Still, a superb spot and well worth the drive along the peninsula. From here, a right turn at Salen, up to Acharacle to view Loch Shiel is another must-do. On our 2018 visit the Loch held Ring-necked Duck and this year we were treated to our first Sand Martin of the year, a flock of 20 Whooper Swans and literally thousands of Redwing – possibly of the Icelandic coburni subspecies) – blanketing loch-side fields and fences. 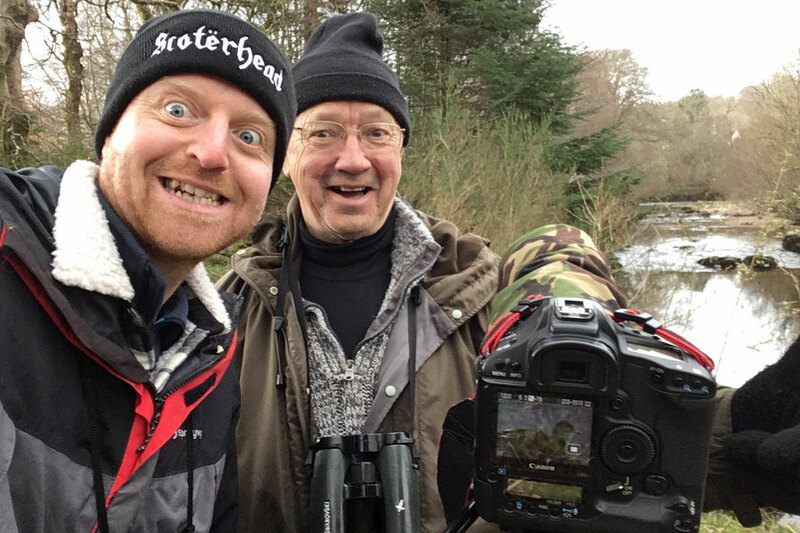 Intense, unadulterated joy after ticking the Strontian American Black Duck (Jonny Rankin).